A renewed Memorandum of Understanding (MoU) was signed between Ugyen Wangchuck Institute for Conservation and Environmental Research (UWICER) and University of New England (UNE), Armidale, NSW, Australia, on 23 March 2019. Professor Annabella Duncan, the Vice Chancellor of the University and Mr Shacha Dorji, the Director of the UWICER signed the memorandum. The first MoU between UNE and UWICER was signed in 2013. Since then, UNE and UWICER has immensely benefited in terms of joint research activities and faculty-student exchange program. 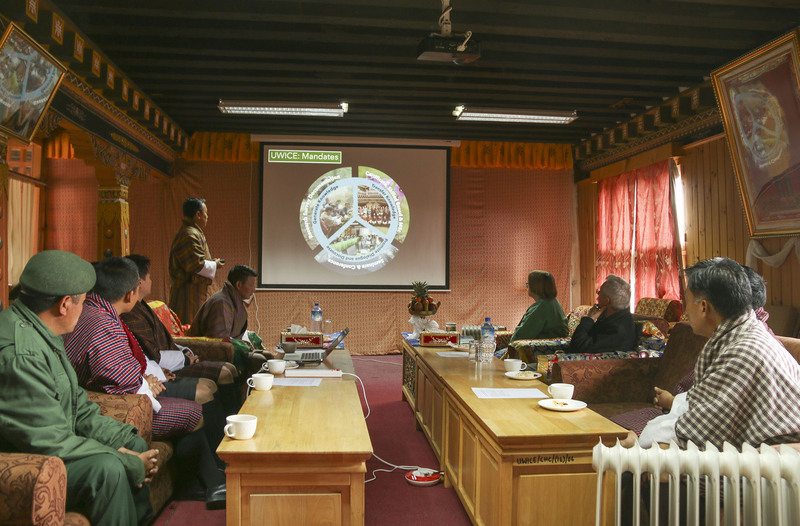 Annually, UWICER hosts 18 UNE students to conduct the field-based research activities on the Himalayan Ecology and Biodiversity and Himalayan Geology in Bhutan. While such program not only promotes experiential learning, it also provides a unique opportunity to exchange culture and tradition among students and faculties of both countries. The program also saw the presentation of testamur by the Vice Chancellor to a graduate student who recently completed his doctorate program from the University of New England, Australia. Further, the Vice Chancellor agreed to provide a PhD scholarship to the Institute. The renewed Memorandum of Understanding (MoU) is expected to further strengthen and scale up the existing collaborative program between two Institutions.